MPs can waste more than 250 hours queuing to vote over the course of a five-year Parliament, Green MP Caroline Lucas has said in a report. 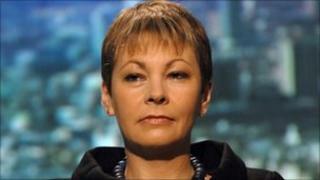 Ms Lucas is calling for electronic voting in the Commons - like in the European Parliament. At the moment, MPs queue up to walk through the "aye" and "no" lobbies when voting on legislation. But Ms Lucas has calculated this can take up to an hour and a half of MPs' time every week. That adds up to £30,000 a week in salary costs - and can waste the equivalent of six weeks over the course of a full five-year Parliament, based on the 2005-2010 session, according to her report. Ms Lucas, who became the Green Party's first MP in May, also called for an overhaul of Parliamentary language to make it easier for the public to understand. She also wants a list of speakers to be published before a debate - ending the traditional practice of MPs jumping out of their seats in an effort to "catch the Speaker's eye". She is also calling for an end to late-night sittings to help MPs with families and greater time limits on speeches. The procedural tactic used by MPs to derail private member's bills - the only chance backbenchers get to make new laws - by talking them out must also be banned, the report says. Ms Lucas, MP for Brighton Pavilion, said: "Since being elected to Parliament six months ago, I have been deeply shocked by the inefficiency of the outdated systems at Westminster. "At a time when the political process is struggling to achieve legitimacy and credibility in the eyes of the public, it is more vital than ever for Parliament to demonstrate that its work is efficient, transparent and accountable. "Now is the time to shake off the image of the 'Old Boys' Club' - and move Westminster into the 21st Century. "What's more, as the government's programme of severe spending cuts to reduce the deficit comes into force, the financial cost to the taxpayer of time-wasting in Westminster takes on a new and more urgent significance. "In the last Parliament there were over 1,200 votes. Since it takes about 15 minutes per vote, that means an MP with an 85% voting record would have spent over 250 hours queuing to vote - a huge waste of time and money." Ms Lucas is sending a copy of her report to the party leaders at Westminster.